The other day I was working a crossword puzzle that included this clue: Double French affirmative. The answer, of course, was, “Oui! Oui!” Strange as it may seem to us, French speakers will sometimes actually say, “Oui! Oui!” “Yes! Yes!” like that. But it’s really not that strange. In the years when Jesus walked the earth in Judea, where people spoke Aramaic, words were often repeated twice like that. Jesus Himself spoke this way. There’s a reason why I’m making this point. It’s because in the one verse I want to focus on in today’s message, John the gospel writer emphasizes something about John the Baptist, something it’s important for us all to catch, something it’s important for all Christian disciples to apply to our lives. John never failed to confess and confessed all the time. John insists that he is not the Messiah and that no matter how many thousands may come out to hear him preach and receive his baptism of repentance, he is nothing and the Messiah to come, the Savior, is everything. Why is that such a big deal? For one reason, had John gone along with people’s desire to treat him as though he were the Messiah, he could have gotten out of that ridiculous outfit of his and maybe eaten something tastier than locusts and wild honey. Who knows, maybe he could have wangled his celebrity into a kingship or gigs at the first century Judean version of Las Vegas? John the Baptist could have become an important person in the world’s eyes. Imagine the faith required of John to turn away suggestions that he was hot stuff! The other reason I think that John’s double confession of not being the Messiah is so remarkable is that his message is so counter, not just to first century culture, but even more to twenty-first-century culture. John couldn’t care less about whether his achievements in this world stroke his self-esteem or make others bow down to him. What John cares about is being faithful to the God Who would send the Messiah Jesus to save all who surrender to Him from the eternal death we deserve for our sin. John had no need to be important in the eyes of the world. It was enough for him to know that God loved him and the whole human race enough to send His Son to die and rise for them...for us, you and me. John didn’t need a trophy for participating in the bowling league. He didn’t need to win an argument. He didn’t need the affirmation of the crowds. John knew that the God Who made him was going to save and remake all who trust in His Messiah. And that was enough. Is it enough for you and me? Is Christ enough for you and me? If Christ isn’t enough for us, we need to repent and trust in Christ. Again. Today and every day. The team planning a discipleship conference for our district of the North American Lutheran Church, which will be held this coming February, met in this building yesterday. Doug and I are on the team and I’m hoping that every member of Living Water will attend. It’s no trouble for any of us to identify what we want, what we think, what we feel. And these sorts of questions apply as much to our personal lives as they do to our congregational lives. What does God want? What does God think about our desire to buy a new house, work with the poor in a Third World country, take the promotion with the bigger pay even though I love the work I’m doing right now and don’t really need the raise? What does God say about someone's desire to end their marriage rather than working things out? What does God want? This is the question of a disciple seeking to be faithful to the God they know in Jesus. It’s the question of the person who, like John the Baptist, confesses and confesses repeatedly that they, that we, aren’t God. We aren’t in charge. We don’t have the final say. The fundamental war every Christian disciple must wage is the fight to subdue our own egos, our inborn desire to “be like God,” and to instead, surrender totally to Jesus Christ. But know this: When, like John the Baptist, we put God first and ask that His will be done and not our own, God will ask us to take risks of faith. God told Abraham and Sarah to go to a place He would show them. He told Moses to traverse the wilderness with the whiny people of Israel until He said to stop. He told David he could take on a giant. He told Gideon that his army was too big; he needed to rely on God by whittling the army down. He told Ezra and Nehemiah to rebuild Jerusalem even though they didn’t have the resources, didn’t have the technical skills, and were surrounded by enemies. The risks of faith God asks us to make often don’t make human sense. In fact, when a course of action meets our human standards of "common sense," it's probably the wrong way to go. God's sense usually doesn't make common sense. And most of you here know about that. When a group of people left a congregation of which they’d been members for decades because they believed that congregation was no longer faithful to the gospel, then formed Living Water, it didn’t make sense. But God was faithful. When Living Water faced division over disagreements, some wondered if it made sense to continue the life of this congregation. But God was faithful. When this congregation was forced to move out of a 38,000 square foot school building that would be torn down five months later, some thought it nonsensical to think that we could continue. But God was faithful and here we are. God doesn’t promise that when His people confess and keep confessing their faith in the God we know in Jesus, everything will turn out great in this life. 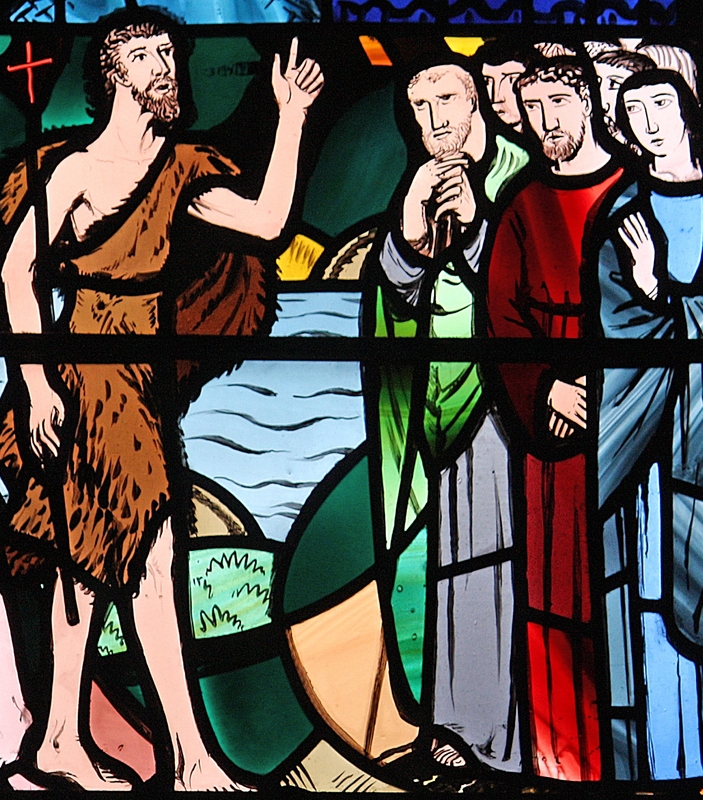 John the Baptist lost his earthly life in taking the risk of doing what God called him to do. In confessing Christ as his Lord in his words and in his life though, John also gained something that will never be taken away from him: The life with God that belongs to all who repent and believe in Jesus Christ! Despite the odds. Despite what his intellect or his fears or his heart may have told him, John confessed and kept confessing his faith in Jesus. We are called to do no less! Stand firm and keep confessing Jesus always!